Knack 2 was a surprising announcement by Sony during PSX 2016. The first game didn’t exactly garner a lot of praise or sales, but Japan Studio is nonetheless going forward with a sequel that’s due later this year exclusively on PlayStation 4. During a recent press event, Glixel was able to speak with the game’s director Mark Cerny (known as the Chief Architect of Sony’s PlayStation 4 & Pro hardware). An interesting tidbit is that Knack 2 will feature a much deeper and more varied combat system, directly answering fan feedback after the first game, and this will include a “Fist of the Northstar style multi-punch” move. Movesets are a lot larger this time. There are a lot more combat moves, much more than just the couple of punches and a kick. 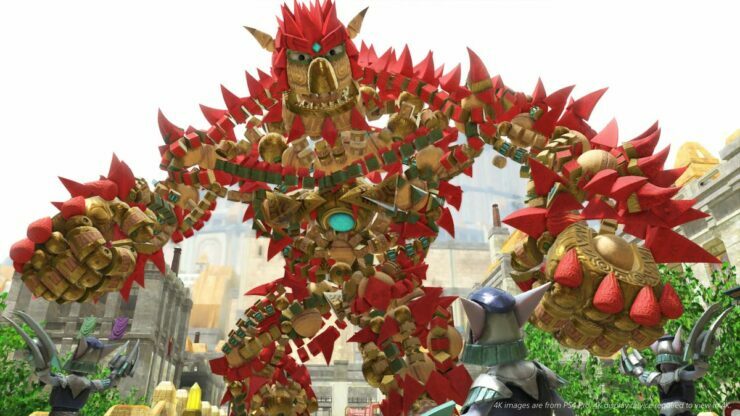 The moveset just keeps expanding the more you play, so by the end of the game there will be a huge number of combat moves that Knack can do. You unlock them with an in-game currency and there’s a skill-tree with 30-odd moves and variants to unlock. This was really in response to feedback that we got on the first game – people said they wanted much more variety. Do you remember Fist of the Northstar? If you hold down the punch button you do a Fist of the Northstar style multi-punch now. Japan Studio had previously announced that there will even be a skill tree to upgrade the various abilities after collecting Relic Energy throughout the levels. Drop-in/out cooperative play is also featured throughout the entire game in a much more organic way, despite the absence of any story explanation for it. Knack 2’s story will be written by Marianne Krawczyk, known for her work on the God of War series, though once again the title will be very much gameplay focused. Are you looking forward to this sequel? Let us know below.